Little M has been waking up about an hour earlier than usual for the past week or, in tears. I had thought that it was maybe because she’s due to drop a nap, but today I found a tell-tale sign – two sharp little points poking through her top gums – molars! Little M has twelve teeth now, so I feel I know a little bit about what helps her when she’s teething. But we all know that what works for my teething baby, doesn’t always work for all teething babies. 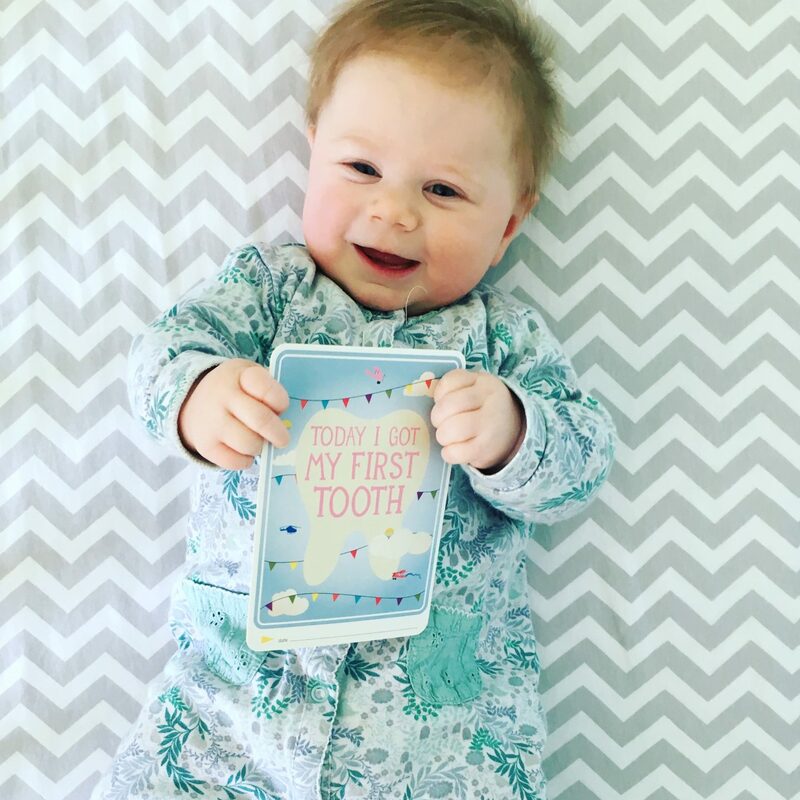 With that in mind, I’ve asked for some advice from my blogger friends and put together these tips for easing the pain for a teething baby. I’ve also got a giveaway for a Matchstick Monkey teether, at the end of the post. Make sure you have a couple of bottles of Anbesol Liquid hanging around; it might be worth having one upstairs, one downstairs and one in the changing bag! It works really well for Little M, so we swear by it. Dribble bibs – if your baby is a dribbler, this can get ten times worse when teething! Dribble bibs will help to keep their top and skin dry. Why not get a variety of different designs and make them a fashionable accessory to your baby’s outfit?! Cucumber! If your baby has started weaning, then a cold stick of cucumber can really help to cool the gums and ease teething pain. Teething granules – these can help ease the pain of teething. Pop some on a spoon to make them easier to administer. Cuddles! Sometimes a teething baby just needs some comfort. It might not feel like it at 3am when you’re awake with a screaming baby, but those cuddles are the best thing you can give your little one. Ice lollies – why not try making some breast milk ice lollies? Annabel Karmel does mini lolly moulds. The cold, hard lolly will help to sooth those painful gums. Neckerchews – Made by Cheeky Chompers, these clever neckerchiefs combine a dribble bib with a teether – so there’s no need to worry about your baby misplacing their teether! Teething necklaces – great fashion accessory for you, and a teether for them. Perfect! You can find some lovely designs here at Apples and Pips. Teethers – It’s worth trying out several different ones your baby might prefer one over another. To help ease the pain of your teething baby, we’re giving away a Matchstick Monkey to one lucky reader! Matchstick Monkey is the two-in-one teething toy and teething gel applicator. If you’d like a chance to win, simply enter via the Rafflecopter below. There is one prize of a Matchstick Monkey, provided by Pondering Parenthood. No cash alternative. Competition ends 27th August 2017. With many thanks for contributions from: Maidenhead Mum, Hello Deborah, Me, Him, the Dog and a Baby, Mum, That’s Me!, The Smallest of Things, Hotchpotch Mum, How to Rock at Parenting, Real Mum Reviews and One Small Human. "I’m a Helicopter Parent – and I’m not sorry"
It’s a cute little teether but Rafflecopter is not loading for me! Oh no! Thank you for letting me know. I will try to sort it! All working now, many thanks.